The kybun mat is a soft, supple, springy mat. Its reactive crumple zone allows the foot to sink in deep and springs straight back to its original position. The kybun mat encourages the body into constant, minute movements to maintain balance and posture. The rebound effect causes the muscles to tense and relax reciprocally, exercising the muscles in your feet, legs and trunk. Like kybun shoes, the kybun mat improves your balance, coordination and all-round fitness without taking up any extra time at all. The kybun mat is particularly suitable for rehabilitation and therapy. The soft surface animates the body to permanent movement and strengthens the foot, trunk and deep muscles. Thomas Bochdanksy, head of the Department of Physical Medicine and Rehabilitation at the Regional Hospital Feldkirch / Rankweil, examined the effect of kybun mats. The study shows that training on the kybun mat causes a much greater appeal to postural stability than a conventional PVC mat. This intensive form of balance training improves the function of the deep muscles and also contributes to the reduction of pain, especially in the area of ​​the lumbar spine. Walking and running on the kybun mat reduces the impact on the joints, expands and strengthens the deep muscles and improves coordination. The trunk is the basis for any movement in your extremities. Generally, it can be said that the stronger that basis is, the better (more precise, targeted, extreme) the movement is. Exercising on a kybun mat leads to a general improvement in your balance and can thus help reduce your risk of a fall. The kybun mat can play a valuable part in every field of preventive work (primary, secondary and tertiary prevention). Moreover, instability can also play a major role in improving your dynamic control of your joints, leading in the case of degenerative illnesses to better kinematics and kinetics and thus ideally distributing the load on your joints. 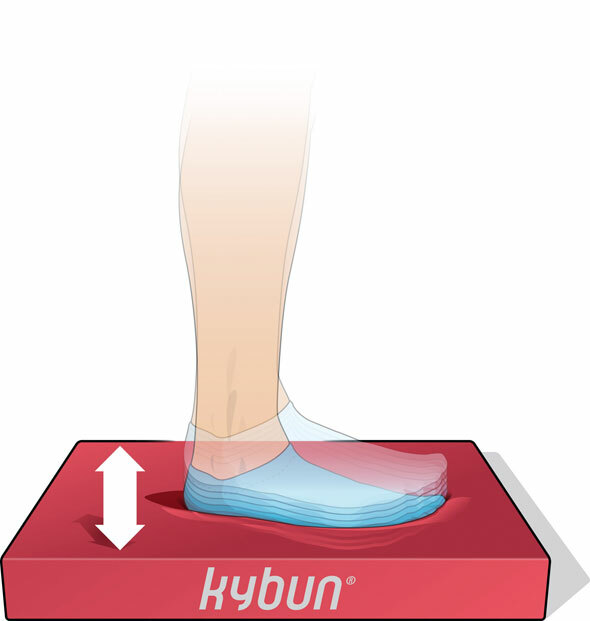 When measuring balance, it was found that the kybun mat provided the most instability compared with other exercise mats. From this we can conclude that balance training on the kybun mat can have a greater effect on dynamically stabilizing the spine, and should thus have a high primary and secondary effect in preventing backache. The kybun mat meet both of these requirements. Each individual rehabilitation exercise you do is far more effective when using the soft, springy surface, which leads to speedy and effective results. This is due to the quality of the material. The polyurethane in the kybun mat means the mat always cushions against the pressure from the weight of the body. As a result, your feet and the rest of your body are constantly moving, which exercises the deep inner muscles and releases tension. If you’re a medical or rehabilitation professional or would just like to order a kybun mat for your own therapeutic reasons, please call us at 250-868-2951 to inquire. Caroline Winter had been suffering from severe sacral joint pain ever since the birth of her daughter. Visits to an osteopath and a regular fitness regime allowed her to keep the pain temporarily at bay. However, whenever she took breaks from her exercise schedule, the pain would return. The kybun mat allows you to improve your fitness during each working hour. The constant motion on the soft, springy surface trains your deep inner muscles and relieves stress. The kybun mat has helped many people eliminate back pain. It also ensures that you feel less tired after your lunch break and makes you less prone to catching a cold. Standing dynamically on the kybun mat offers countless benefits and makes you feel like you are on a trampoline, which is simply great fun. While employees benefit from these advantages, employers also profit from the significant increase in productivity. The Tipiti school in the Appenzell region in Trogen, Switzerland, is trying something new. They are implementing an innovative pedagogical approach that allows the pupils to move freely in the classroom. This brings variation into the daily routine at school. It encourages the pupils to be active and prevents bad posture and muscle tension. The increased amount of movement has made the classroom more quiet and peaceful. You can find out what the pupils themselves say about the kybun mat in the video clip. Nurses are always on their feet, helping their fellow human beings. They ensure the well-being of their patients, day in and day out, while often forgetting about themselves. Things were different at the nursing conference at the Davos Congress Centre, where many talks were given, putting the focus entirely on the nurses. The nursing professionals had a chance to experience a completely new way of sitting and standing, thanks in part to the soft, springy mats and soles from kybun. It was a wonderful experience that brought a smile on the participants’ faces. FC St. Gallen regularly demonstrates its skills in front of thousands of spectators. The fitness of players is not just a matter of chance. The Espen players train with the kybun mat. This allows them to optimally train their muscles without putting strain on joints.